The Hanged Man shares that after the crisis of seeing what you have made of your life comes the peace of acceptance. Love alone can effect the transformation to “obedience” through which your will is able to “perceive” the revelations from above which inspire, direct and strengthen you. Your choice to obey renders your will capable of receiving the divine call from above – the gift of faith – the union of your will to Gods will, leaving behind the powers of thought and imagination. Authentic faith produces absolute certainty as you pierce the barriers of your limited consciousness and avail yourself to the higher wisdom. Allow yourself now to experience the power of “stillness” and you will be blessed with truth. Look above your present situation – prepare your mind for new and innovative ideas – a complete and unexpected change at home and at work. Trust and have faith that there are unexpected views, attitudes or decisions on the horizon. Your heart is the center of LOVE – it abolishes distance and has the power to make all things present. God is present in a heart that is glowing with love, for this heart perceives His spiritual warmth and learns not to reject anything…for authentic faith renders everything truly useful – it gives value, meaning and purpose to everything. Do the opposite of what your “ego” ordinarily expects and you will achieve victory. Release your self-aspirations, be patient, accept yourself – understand your limitations and success will soon follow. Look at what you have hidden – turn your shadows into light and you will control the forces which control your life. It is the process of your “ego” or “waking” mind to first think – it must first imagine, feel and desire before it will finally choose to “act”. Your Higher Self “acts” first – then it desires to KNOW, then it feels the worth of its action and lastly it understands – for its FAITH is the firm assurance of things hoped for and the conviction of things not seen. Your “will” KNOWS while your mind and imagination “have not yet seen or understood”. You will now experience the reversal of attitude and experience that comes through spiritual awakening as you are taken out of the ordinary consciousness – that of reason, memory and sensual perception. You will learn to “act” before your thought and imagination have understood what your action implies. While everyone else is frenzied – you will know peace. While other people “believe” themselves to be free, yet are pushed from one thing to another by forces which they do not understand – you will achieve true freedom by understanding and embracing those forces. You KNOW that you must seek solitude wherever you find tension – for in solitude you live, develop spiritual temperament, breath spiritual air, quench your spiritual thirst and satisfy your spiritual hunger. In solitude – you are in control, poised on an “inner” level, centered in peace and through chaos you maintain serenity by reversing the usual way of living and finding contentment. Pause now, be willing to listen and observe things as they really are – not as they “appear” to be on the surface. Suspend your decision-making and remain passive now – use your sympathy, tact and maintain tolerance by centering yourself within. You still fear that there will be risk and sacrifice in your decision to abandon your worldly values and plunge into the depths of “Self” to seek the inner reality needed to become whole – but from this sacrifice, from your willingness to put aside the world for a while and experiment with the “inner” experience will come enlightenment and renewal. Accept your fate and you will be re – born. When you try to evaluate any situation based solely on your limited, conflicting beliefs – you will always feel powerless. LOVE does not demand any sacrifice. Sacrifice is nothing more than your own passive surrender to fear and despair. As you try to hold two conflicting ideas simultaneously and equally in your mind – you actually stalemate yourself. “FEEL” the spiritual power within you – allow yourself to surrender to it. Experience it, “feel” the great power and excitement which exists in the midst of complete calm. Withdraw to your “inner” awareness and allow yourself to BE who you are – even if everyone thinks you have everything backwards – allow yourself to experience the calming peace. Be willing now to make your mind a clear, reflective vessel. Suspend your judgments and your expectations so that you might receive higher knowledge. Emotional development, you swing from passionate to compassionate, from inner to outer, from self to others. Opening of the heart chakra allowing others easier access. Life becomes more public as you externalize and extend yourself into your environment. Major emotional change – literally turned upside down as the spiritual descends to your emotional level. Voluntary self-sacrifice to a greater good without sacrificing the self. As the self gives, it gets larger. As the heart gives, it grows. An ability and willingness to accept suffering. The open heart is a trusting heart. A change of heart – the heart working vertically to balance the mind and body. What do you expect from the sacrifices you are making? What are you devoted to? How are you hung up? What do you need to get straight? How are you seeking higher knowledge? In the first position: People, relationships, expression are central in this lifetime. Creative juices must flow – an open heart must prevail. In the second position: Your network of supporters and fellow team players is strategic in your Physical/material Plane. Social life figures prominently in your family, business, and your leisure activities. It may be difficult to draw the line where the social ends and the rest begins. In the third position: This is an infusion, even a bombardment with the force of God’s love in answer to your devotion. Preparation for a kundalini experience, or the opening of the heart chakra. In the fourth position: Yours is a love of people and the give and take that social interaction affords. The more activity, the more people, the better. But, you are serious and sincere. This can also be complete openness and dedication to an innate talent that will be the centerpiece to your life. Here again though…it will take you outward and upward on an extroverted course. In the fifth position: You are intellectually involved with devotional disciplines, such as Bhakti or Tantra Yoga, or other path work using the heart as guide. Here the mind is yielding to the influence of heart wisdom, the intelligence also of the solar plexus. This is a poetic state of mind. In the sixth position: The heart will be opening further in the near future and you will have many emotional balls in the air at the same time. This is a chance for a breakthrough in relationships or in a creative project. A great deal of energy will be available for your use. In the seventh position: Here you will have to integrate input from your higher emotions into your mental package. This may be in the form of a creative burst or the impact of others – guides, teachers, loved ones. The smaller ego self is becoming the larger transformed Self. In the eighth position: New dimensions are opening on the Physical Plane. There is an increase in opportunity in material matters. There is a deeper appreciation of the arts, of the emotional side of life, of that illusive yet ever available thing called beauty. 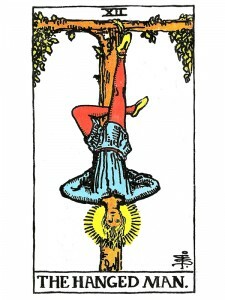 In the ninth position: Here is the Hanged Man at its strongest as it sits in its home position. This is the opening of the heart chakra and any or all of the above general meanings may apply. Complete trust – complete sacrifice. Little if anything is held back, and yet as you offer your blood you are strengthened with every drop taken. A positive, correct change of heart. A reversal or clearing of a prejudice. In the tenth position: You are now strong enough, having teamed well the efficiency of give and take. You are ready for the major shift from the predominance of taking, required on the first part of your journey, to a predominance of giving required on the second half. Many more of your vehicles are being opened by grace to participate in path work on a much larger scale than ever before.